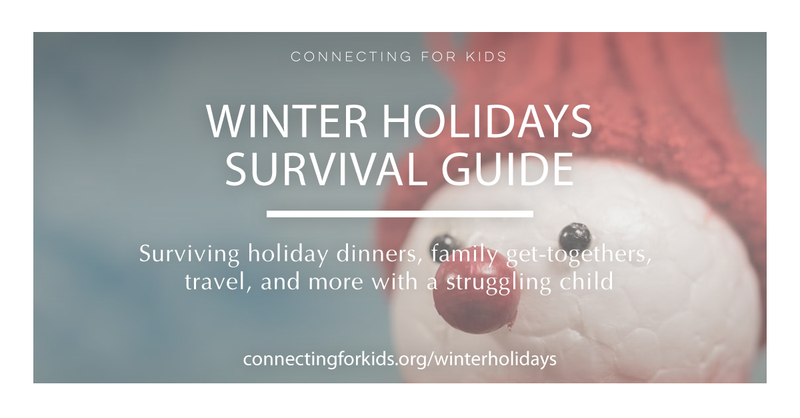 The winter holidays are hard for any family to handle, but for families with children who struggle, this season can bring up lots of unexpected problems. From helping your child to accept gifts of socks and ugly sweaters gracefully to teaching family members why allergy-friendly food handling is a life or death situation, our Connecting for Kids families have stepped up to help. This guide includes holiday-saving tips from real families, along with additional resources to help your family make the best of the holiday season. We polled CFK families and asked what was the most important thing they wished their own extended families and friends knew when it comes to celebrating the holidays. Responses included everything from asking for understanding when they were forced to leave early to wishing that someone would visit with their child long enough so that they could go to the bathroom alone. You can read the full list here. Do you have a concern that was not covered in this guide? Join us in one of our closed Facebook groups and get real advice from real parents. learn more about our groups here.